U.S.-North Korea Summit: Read The Statement By Donald Trump And Kim Jong Un In the statement, the leaders outlined four commitments including establishing relations, working toward denuclearization and recovering POW/MIA remains. 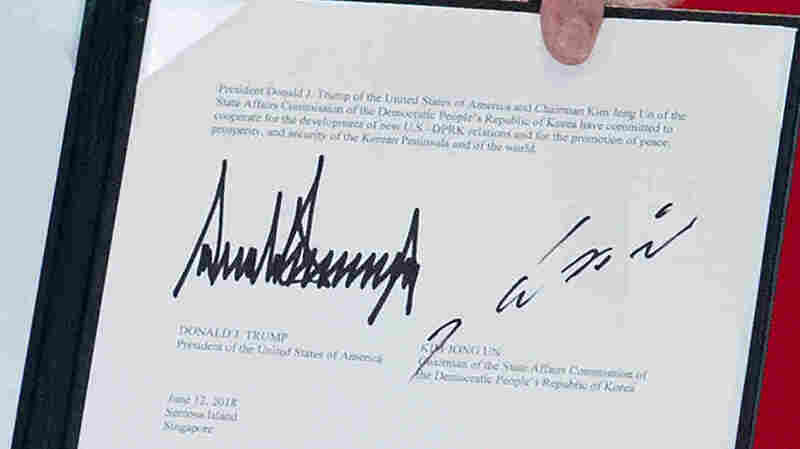 The signatures of President Donald Trump and North Korean leader Kim Jong Un are seen on a document held up by Trump following a signing ceremony during their U.S.-North Korea summit in Singapore Tuesday. President Trump and North Korean leader Kim Jong Un signed a statement Tuesday promoting "mutual confidence building" to "promote the denuclearization of the Korean Peninsula." In the statement, the leaders outlined four commitments: establishing relations, building a "lasting a stable peace regime on the Korean Peninsula," working toward denuclearization and recovering POW/MIA remains. President Donald J. Trump of the United States of America and Chairman Kim Jong Un of the State Affairs Commission of the Democratic People's Republic of Korea have committed to cooperate for the development of new U.S.–DPRK relations and for the promotion of peace, prosperity, and security of the Korean Peninsula and of the world.